Just when it seems the country couldn’t get any more divided, along comes the most raucous, drag-down, incendiary midterm election cycle in at least a generation, maybe ever. Two political parties? At times it feels like two nations. We wanted to know: Where do these deep divisions come from? And how much of a role does something as fundamental as housing play in the great red versus blue debate? A very big one, as it turns out. Let others debate immigration policies, tax reform bills, and presidential temperaments. No, realtor.com® took a deep dive into the nation’s real estate—analyzing all aspects of housing and demographic data in the counties that President Donald Trump and Democratic contender Hillary Clinton each won in 2016—to shed a brighter light on just how we got here as a nation. And where we’re going next. We found stark differences between America’s red and blue real estate—everything from the cost of homes, the number of places being built, even the credit scores it takes to buy a home. “Not only are people living in different political realities, but they’re contending with very different housing realities and paying different amounts for it,” says Mark Muro, senior fellow in the metropolitan policy program at the Brookings Institution, a think tank based in Washington, DC. Where voters live may be the most crucial factor in what side of the political equation they’re on. Trump won 2,625 counties in the 2016 election compared with Clinton’s 487. * But Clinton won the expensive, diverse, and crowded big cities while Trump swept the inexpensive, more sparsely populated rural America. That’s why she won the popular vote by nearly 2.9 million ballots. The suburbs remain the country’s battleground. At the same time, more liberal-leaning Americans are moving to red, Southern states such as Texas and the Carolinas, lured by their warmer weather, affordable housing, lower taxes, and good jobs. It’s why most demographers predict a major shift in the political breakdown of the U.S. in coming years. To come up with our findings**, the data team at realtor.com looked at internal listings for prices, appreciation, home sizes, and the percentage of new construction in each county. We calculated buyers’ median down payment and credit scores through Optimal Blue, a digital mortgage trading platform. We used Nielsen for income and general housing demographic data. And we turned to the U.S. Census Bureau for population information. We looked only at counties because we wanted to take a more granular look at the nation’s housing differences, something state data couldn’t provide. So let’s go to the realtor.com electoral map! Price alert: Which counties have the most expensive homes? Despite Trump making a name for himself with luxury real estate, the counties he carried had the nation’s cheapest housing—by a long shot. 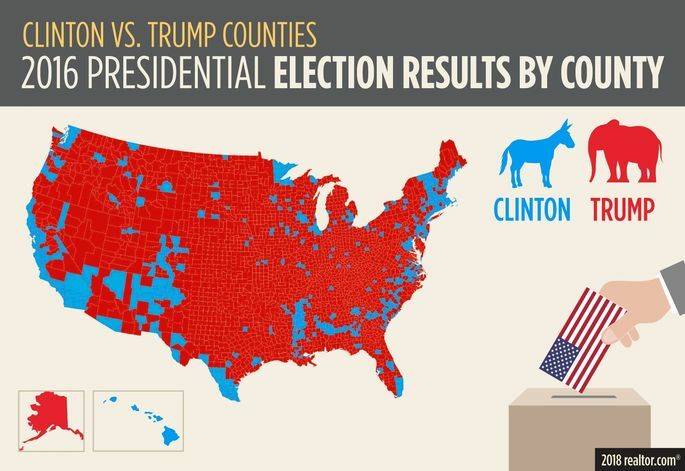 And the homes in red counties have appreciated less than those in blue counties since the presidential election. It’s because Trump found his base in more rural, less wealthy parts of the nation. Clinton, meanwhile, won the country’s largest and priciest cities, including San Francisco, New York, and Boston, where land is at a premium. The median home list price was $262,612 in September in counties that voted Republican in 2016. 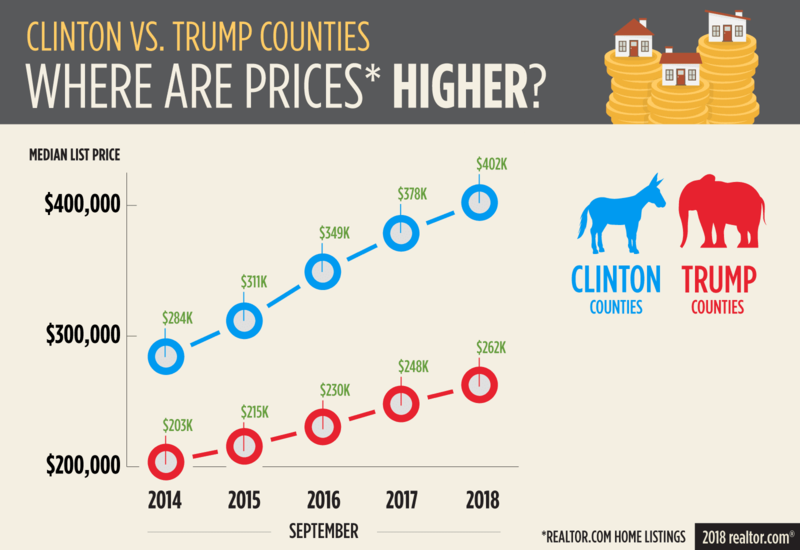 That’s 12.3% lower than the national median of $295,000 and 53.1% lower than the $402,200 median price in counties that went Democratic. Clinton won 31 counties that are more expensive than Trump’s most expensive county. The nation’s most expensive county was rarefied vacation destination Nantucket, MA, a 14-mile-long island off the coast of Cape Cod, where the median list price was $2,495,050. Former Democratic presidential contender John Kerry recently sold the second home he shared with his wife, Teresa Heinz Kerry, for $17.5 million. The cheapest county is deeply red Blackford, IN, over an hour and a half northeast of Indianapolis. The median list price in the agricultural area is just $55,050. While the price disparity is jarring, the appreciation gap is closing. In the two-year run-up to the 2016 presidential election, homes in counties that voted for Clinton appreciated by 22.9% compared with 13.2% in Trump counties. However, in the two years since—from September 2016 to September 2018—home prices have accelerated at a breakneck pace all over the country as the national economy continues to improve, and the president’s tax reform legislation has gone into effect. Blue county appreciation was 15.2%, while red counties gained 13.9%. Rent vs. buy: Where do the most homeowners live? With prices so much lower in red counties, more folks can become homeowners without going broke. The homeownership rate is 71.3% in red counties and just 59.5% in blue counties. Now, that’s something to tweet about! 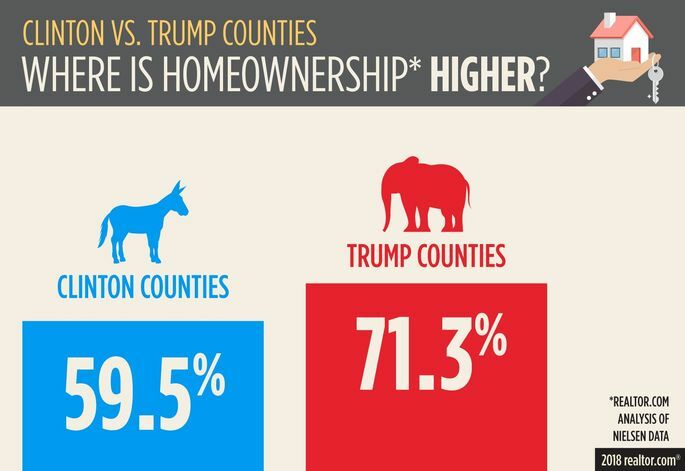 “Homeownership is more affordable in Trump counties, so even with a lower income you can have a higher homeownership rate and a larger home,” says Chief Economist Danielle Hale of realtor.com. But it’s not just price tags determining those rates. Cities tend to be filled with younger residents, including all manner of millennials hoping to strike it big. They often can’t afford to buy in the nation’s top cities—let alone make rent without tripling or quadrupling up in tiny apartments. Instant ramen, anyone? Plus, there’s not the same stigma attached to renting in big cities, where homeownership isn’t always the norm. You can put down roots, have a great job, and not own a home. It’s a common way of life. These are the kinds of differences that can affect how Americans see the world and measure their perceived successes and failures. One big political difference between homeowners and renters is that about two-thirds of the former voted in the past presidential election, according to a recent study by Apartment List, a rental website. Only about half of renters did the same. And while homeowners are just slightly more likely to lean right, renters are significantly more likely to lean left. “Homeowners may have different values and want different things than those who are renting,” says Muro. Size matters: Which counties have the largest homes? If you’re looking for way more space, move to Trump country. Homes in counties that he won clocked in at a median 2,014 square feet—about 82 more square feet than in Clinton counties. That’s because residences tend to be much smaller in the top cities (interested in a nice 250-square-foot, micro-apartment, anyone?) than in the more sparsely populated country where land is cheaper and homes aren’t built right on top of one another. Show us the money: Where do folks earn the most? Blue counties have more high-tech centers offering well-paid gigs to those with the right skills, while red counties are more oriented toward lower-paying manufacturing, agricultural, and service jobs. And with factories continuing to close, move offshore, or replace workers with technology, many of those jobs are disappearing. Over the past few decades, it’s also become harder for small farmers to make ends meet. “The blue counties have seen significant pay increases and are better positioned to deal with the future of a high-end, digital economy,” Muro says. How voters and their local communities are doing economically can play a big part in which side of the political fence they’re on. Trump went after the blue-collar vote and since the election has been imposing tariffs on countries competing with core American industries. This is designed to give his base a financial boost. In the past year, about 35.4% of Trump counties lost jobs compared with 19.2% of Clinton counties, according to an Associated Press analysis. The AP looked at monthly government jobs data from June 2017 through May 2018. Meanwhile, about 58.7% of the new jobs were created in blue counties. These sorts of differences in wealth and job prospects could lead voters to cast their ballots for very different candidates. “That does reinforce the idea that we’re living in quite different realities,” Muro says. Credit scores and down payments: Which counties have the highest? When it comes to buying a home, it’s typically harder to do so in left-leaning urban areas of the country, where homes are more expensive and buyers need higher credit scores and down payments. The median FICO score in Clinton counties was 731 compared with 709 in Trump counties. (We looked at Optimal Blue mortgage data from June, July, and August 2018 to come up with our findings.) Meanwhile, buyers plunked down a median 10.2% of the purchase price in blue parts of America and 5.4% in red swaths of the country. The lower down payments are thanks to U.S. Department of Agriculture loans, some of which don’t even require putting any money down. Buyers can snag these loans with credit scores of 640 or even lower in some cases—provided they live in rural areas. This has helped those in Trump country become homeowners. That’s certainly not the case in Manhattan, where buyers forked over a median 27.2% of the median $1,650,050 price of their New York City homes. That hurts. Buyers in expensive cities may also opt for mortgages with higher credit and down payment requirements. Conventional loans are more popular in ultrapricey areas because they offer higher loan limits and lower-cost private mortgage insurance, which kicks in when buyers don’t put 20% down. Sellers in competitive markets are also more likely to prefer conventional loans because they have less stringent loan appraisal processes. But conventional loans have higher minimum credit scores, typically 620 versus 500 for FHA loans. And they often require larger down payments. Cities vs. rural America: Who lives in the most populated counties? Clinton may have won a fraction of all counties, but the ones she took were vastly more populated. Blue counties had a median 104,202 residents as of July 1, 2017. That’s about 4.5 times higher than the median 22,828 people living in Trump counties. This is noteworthy because residents who live in more populated areas are more likely to come into contact with a more diverse community, on everything from ethnicities to religious backgrounds. And that could affect their views on hot-button issues like immigration, abortion, and birthright citizenship. “It could be that where and how you live really affects your views on people and how you vote,” says realtor.com’s Hale. But it’s important to note that the population in Trump counties is growing—faster than in Clinton counties. It rose 0.8% in his counties, and 0.6% in blue counties, from 2016 to 2017. That’s likely because Trump counties tend to be more affordable—and usually warmer, too. Just look at Texas. The Lone Star State saw the biggest increase in new residents, about 400,000, from 2016 to 2017. “Millennials are flocking to Texas because they can buy a 2,000-, 3,000-square-foot home for under $300,000,” says demographer Ken Gronbach of KGC Direct. So what does that mean for future elections? Construction alert: Where are builders putting up the most new homes? Which counties see more building? It’s fitting that new residential construction would be much higher in the counties carried by a president who made his name as a builder. About 21.7% of the realtor.com listings in his counties were for new homes, compared with just 15.7% in Clinton counties. 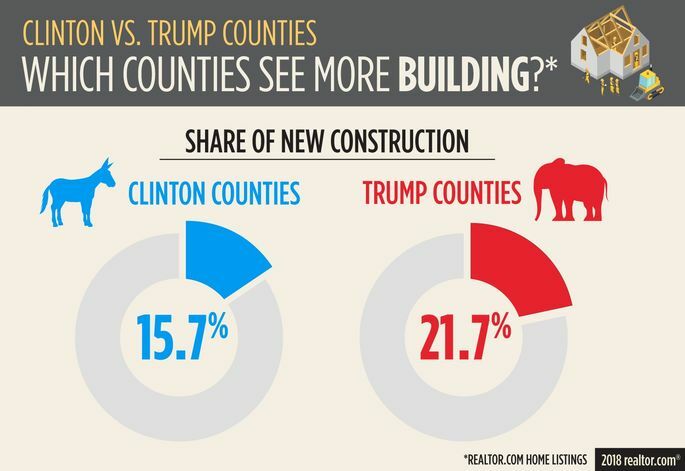 In other words, 19 of the 20 counties with the most new construction were in Trump country. The Houston suburb of Waller County had the highest percentage of newly constructed homes listed on realtor.com. The median home price in the Republican county is $318,000. The reasons are simple: There is simply more land available to build on in more rural areas; there are fewer building regulations, and it’s cheaper to put up new homes. Plus, there’s demand in areas seeing more population growth as all of those new residents need places to live. * Includes county equivalents in Louisiana, Maryland, and Virginia. These counts did not include Alaska or Washington, DC, which were included in the electoral tally. ** We calculated the county medians for all of these different metrics. Then we weighted each one based on the number of households or how many listings they had on realtor.com. This allowed us to create median scores for Trump and Clinton counties. The weighting was done to ensure that counties with the fewest residents didn’t disproportionately drag the numbers up or down.